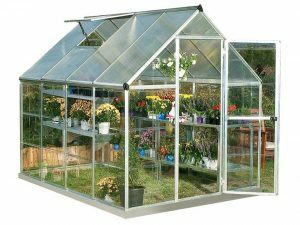 The Palram nature Hybrid series greenhouse brings hobby gardeners the best of both Worlds; the precise balance of two advanced polycarbonates & a durable 6' foot wide frame designed perfectly for your growing needs in smaller spaces. A healthy head-start on your garden begins with light management through Palram' S market leading twin-wall polycarbonate. Twin-wall polycarbonate is the leading choice for quality hobby greenhouse coverings because of its durability, light diffusing properties & heat retaining ability. The twin-wall roof on the Hybrid blocks 99.9% of harmful solar UV radiation & creates a system of diffused light, which helps maximizes plant growth & eliminates the risk of plant burn & shade areas. Crystal clear polycarbonate side panels are equally as durable & provide over a 90% transmission of light. Palram' S version of these virtually unbreakable polymers are made only with virgin materials that won't become brittle or discolor over time. Featuring a rust-resistant aluminum frame & heavy-duty galvanized steel base, the Hybrid series greenhouse is designed to stand for years to come. Other features include integrated rain gutters to channel water for sustainable irrigation, a magnetic door catch & a single roof vent to help moderate air flow & temperature to maximize growing conditions. - Virtually unbreakable 4 mm twin-wall polycarbonate roof panels Block up to 99.9% of UV rays and diffuse sun light eliminating the risk of plant burn and shade areas. - Crystal clear polycarbonate side panels provide 90% light transmission. - Includes plant hangers, adjustable roof vent, rain gutters, lockable door handle with Magnetic door catch and a galvanized Steel base for structural support. - 10 plant hangers included which can be used to support vine crops, hanging baskets or used to install shade cloth to the inside frame of the greenhouse. - Plant hangers are made of polypropylene.